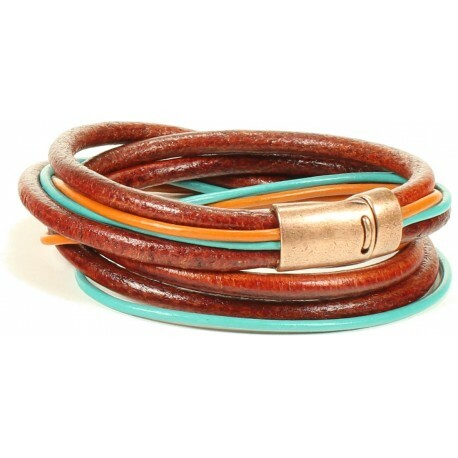 Our Ohio bracelets are just a bit wild and crazy with great color combinations and multiple strands of various sizes of leather cord. You can wear these on their own as a statement piece or you can stack them with some of our other bracelets for an even more personalized look. This particular style is made with double-wrapped strands of 5mm and 2mm leather cord in various shades that evoke a warm spicy effect. Hook clasp is made of a molded alloy with an antique copper finish.